This article is from the Sep./Oct. 1996 AFRMA Rat & Mouse Tales news-magazine. Iwould like to start a rat club here, and produce show-quality pet rats. Most people in this area are only familiar with the black and brown hooded and white rats. I have The Proper Care of Fancy Rats by Nick Mays. Taking this book with me, I have searched for and found the more uncommon and less known types. Please send me any information that would help me market and sell rats, and start a rat club. Thanks! AWe would love for you to start a club in your area, and we will help in any way we can. The best information we can give you on starting a club is contained in the article that was in the July/August issue of AFRMA Rat and Mouse Tales, and continues into this one. Marketing and selling our critters is one of the most difficult things for most fanciers. We know that we have these wonderful, special animals for sale, but no matter what we do, people still go to the pet stores to buy their rats. I usually only breed two or three litters a year, since that is the number of babies I can reliably sell to good homes. One way of advertising, that I have found to be effective and inexpensive, is to take advantage of the bulletin boards put up in local pet shops. I use professional looking flyers with color pictures (Kinkos color copies are very cheap since you can get six to eight pictures on a page). On the flyers I say something like “Pedigreed Fancy Rats For Sale.” I then go on to list whatever colors I have, and mention the fact that they are handled from birth, bred for health and temperament, and make wonderful pets. Once you start your new club, you will find that it is easier to sell your rats. You will have the opportunity to sell to other fanciers, and to new people just entering the fancy. You will also find yourself putting on displays, and talking to many people. This inevitably leads to people asking you the question “Well, if I shouldn’t buy from a pet shop, where should I get my next rat?” Needless to say, this is the time to have a business card in hand. Pet shops are of course the other alternative to selling your rats. Many are very happy to take your excess stock, and some will even pay you for them. Unfortunately, most pet shops consider all rats to be feeders, and your critters could end up as snake food. A few pet shops will take the more unusually colored rats and set them aside to sell as pets. Unfortunately, these stores are few and far between. Does anyone else have a different way of marketing their critters that works well? If so, we would love to hear about it. Drop us a line and let us know. QWhat is the average life span for a mouse? The book I read said between 1½ and 3½ years (rarely seven years). That’s quite a gap it seems to me? AOur members have found over the years the average life span is 1–2 years for mice. It would be the exception rather than the rule if you had mice live longer than 2 years. QToday, my brother and I are now the proud owners of two hooded, 4-week-old rats. So far they’ve been great fun!!! We bought all what a rat could want. Also, we bought a rat book which my question relates to. It said in the book we have to clip and trim their nails and teeth. I’m sorry, but no matter how friendly and cute they may seem, I will never cut a rat’s (young or old) teeth—or nails! Is there any way around this problem? Thanks. AYou should not need to trim your rats’ teeth unless there is a problem such as something happening to the jaw to where the teeth then grow crooked and don’t meet like they should. In this case they could grow right through the roof of the mouth. A vet would need to be consulted in a case such as this and he could trim the teeth for you at that time. If you look at your rats’ teeth periodically and know what they normally look like, when something goes wrong you will know it. QLast week I bought two baby feeder mice, just weaned from their mother, as my pets, and I have a few questions. I have a glass aquarium I use as my mice’s home, 20x11x12. Is this cage big enough? What is the optimum size cage for two adult mice? My male mouse often spends most of the day isolated in a paper towel tube I have put inside his cage. Is this anything to worry about? How often should I replace the wood shavings inside of the mice’s cage? It gets very hot in California during the summer, and I’m worried about my mice getting too hot. I currently have a fan on low power blowing directly over the cage’s steel mesh cover. Should I be doing this? Is there something else I can do to keep my mice cool? And finally, what is the optimum heat and humidity range for my pets? The rule of thumb for mouse (and rat) cages is always “the bigger the better.” With mice, you must choose a cage which allows ample room for lots of tubes, wheels, etc., and I always recommend a 10 gallon or larger. Since your tank sounds like a 10 gallon, your mice should have plenty of room. Keep in mind that if you have both a male and a female mouse housed together, two will quickly become eight, then sixteen, and up, and up, and up! When this happens, living quarters will become rather tight. In the wild, mice are rather secretive shy animals. They are also more or less nocturnal. 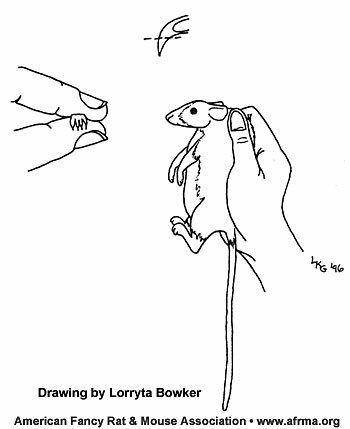 Domestic mice also have these habits, some more than others. The reason your male mouse hides in his tube all day is that he sees it as a nice secure burrow. He probably spends most of the night (while you are asleep) running around. This is normal behavior and nothing to worry about. You might try enticing your mouse out of his tube with a special treat. Eventually your mouse will associate you with the treat, and come running when you enter the room. The shavings in your cage should be changed at least once a week. If it smells dirty before the week is up, then it needs to be changed more often. Keep in mind that male mice (particularly American pet shop mice) have a very strong pungent odor. This is normal, and the mouse uses it to mark its territory. If you disturb the substrate in the cage too often, the mouse will feel he has to mark his territory more often, and the smell will go up accordingly. It takes a little practice, but it is useful to learn to distinguish between male mouse smell and dirty cage smell. The houses, toys, wheels, water bottle, food dish, etc., should also be cleaned each week when you clean the cage. Most mice do not particularly like air blowing directly on them; however, it is important to keep them cool. They do not like hot weather. It is okay to use a fan to circulate air over the mouse’s cage to encourage air exchange, but don’t direct the air to blow directly into the cage. One of the best ways to keep mice cool is to take a Tupperware (or other small sealable container) and fill it with ice. The mice will lie on this to keep cool. A small water bottle which has been frozen will also work. Mice also enjoy frozen vegetables, fruit, and even ice cubes, though you don’t want to make their litter damp. Mice (and rats) should be kept around 65–75 degrees, humidity of 40–60 percent, and out of direct sunlight. They will happily live at cooler temperatures so long as they have a nice snug nest. Warmer than 80 degrees and you need to provide some way for rats and mice to cool down.